"Welcome to JoJo's Diner! How may we help you?" Year 21XX, somewhere deep in space, at JoJo's Diner. You (protagonist nameable) are working your usual shift alongside a bot named Vev, just waiting for the rush hour, when two indivuals with a broken ship engine stumble in. Do you want to stay where you are or do you want to explore space? And what is "home" actually? 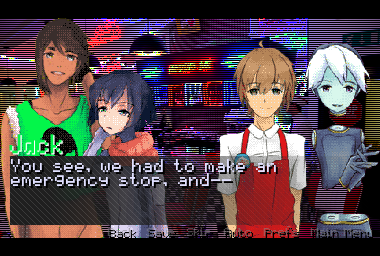 A small Visual Novel for RainbowJam 2017.
choose a name for the protagonist! If you choose to support me, you'll have my eternal gratitude! Every cent goes straight (ha!) to my ongoing BL18+ project Ego Holic. lovely game! it feels very much like the beginning of an adventure :) i want to donate but i can't figure out itch.io's tip system... are you on any other platforms for that? Thank you so much for playing and leaving a comment! I loved the aesthetics and the setting. I think the characters are interesting enough for an expansion, if you're looking to make the game a bigger thing. 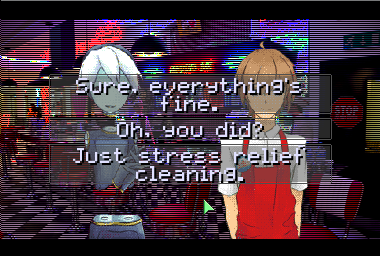 Or maybe a waiting tables minigame where Jack is forced to help, lol. The screen was smol, but like you said, it's a smol game. Also a pretty fun game. Lots of opportunities to expand on, but I'm afraid I'll leave it as that. Maybe one day, when my coding skills are better, I'll revamp it.